I can repack it... but it freezes on load. Must be the exheader or the .rsf file? How did the one guy who renamed everything repack it? I try exinjector to reinsert the header, but if that's the case, the rom won't even display on Gateway's loader. ...It repacked it. Decrypted it and everything. I just replaced the files with the ones by SciresM's modified RomFS Extractor with the proper names. And generated its own RSF file. Like... why is this fully working and commented out? Gonna test out the ROM now. Maybe it's experimental or broken? Otherwise, I could try mass PMing anybody who compiled a CIA in the previous topic. It froze on 3DS loading logo. I'm doing SOMETHING wrong. I'm trying to modify the rom files and repack it to run in Gateway. Citra 3DS is maturing quickly. Realtime emulation is currently possible on a couple games thanks to the opengl renderer/hardware solution. When you ripped the voice clips, Vincent, could you repack those? I might want to replace the Japanese Atashi 1 with the Atashi 2. 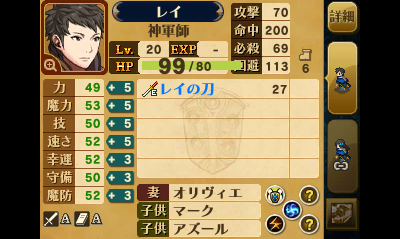 ...simply because Belinda's MU uses Voice 1 in English (mapped to Atashi 1), but on my JP copy, she uses Atashi 2. I just used a dumper; I don't think I saw an option to repack. That said, bcsar files are just uncompressed archives, so it should be easy to edit them in theory. Maybe there are even tools to repack them that I don't know of. Luckily, xorpads are now obsolete, thanks to rxTools. It let's you decrypt things straight off the 3ds's SD card through the browser exploit, and it works on anything between firmwares 2.0 and 9.2. Also, just to note, I think xorpads are in the same boat as roms copyright- and sharing-wise, at least according to GBAtemp. Kind of unrelated... I want to look into data-mining Codename S.T.E.A.M., just in case it supports future FE Amiibos or something, but dunno if it's worth the time. includes ram dumper and explanation on how to use. I look forward to new finds. I lost a weekend to trying to repack my ROM backup of FE:A with Vincent's modified Static. My problem seems to be based around the RSF/exheader. I've done the various guides on building an RSF, both by hand and using rsfgen.exe and rsfgen.py. No dice. I even tired running a few different Make CIA packages and grabbing the RSF they use during the process. The only thing I learned is that those RSF files look very different than the hand made ones but fail just as consistently when I toss them through makerom. Sorry for lacking specifics, I'm at work right now. If I can get this thing repacked I can test on GW, but seriously I am hitting a wall. Does anyone have a solid RSF for Awakening? Even one that was used to make a CIA version should work. Has anyone tried using Citra to boot FE13 yet? It's still far from playable, but it's getting a surprising number of games to boot and even run past titlescreens. I can run roms on my 3ds but I wanted to know, isit possible to run modified ones? I know gateway has put some restrictions on what you can run. I'm sure cia can work though. I will volunteer if you manage to repack the roms. There are UNDUBs out there already. Like Persona Q. It's just horrendously impractical what I can take to just repack a ROM. Like I'm not even modifying or inserting Vincent's file yet. I'm just trying to get it to an executable CIA. ...might just have to stick to the RAM hacking browser option there. What are you using for an RSF to pack the ROM? But again, it's still not working for me. Yes. There's a Russian translation of Link Between Worlds, for example. I have concluded that the character slots are 0x110 in length. I have found that the Character table changes offsets depending on if you have spotpass/DLC. So from what I see just looking at it, it also uses the Internet Browser. The FE13 you loaded, was it by an actual cart? Or was it a digital version. Does it work with a physical cart? I'm always repeating myself, but I really wonder how hair color is saved for a MU (or even Spotpass characters). It works for retail carts, digital copies, and pirate carts like Gateway. Hmm, I think I see the skill bytes: 13 00 5B 00 20 64 00 4C 00. 5B in my list looks wrong though, but my list is just a guess based on the icon order. I added skills 5B to 5F in that order. 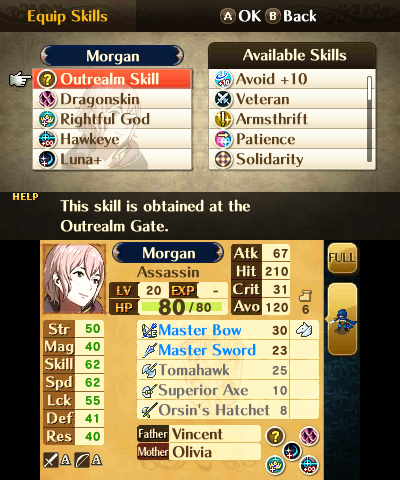 The Outrealm Skill is Limit Breaker, I believe. Oh, I see the inventory now. It's just before the skills and includes the number of uses afterwards. Eg. Orsin's Hatchet is 50 00 08 00, where 50 is the item and 08 is the uses.